The Enduro Star Products TS3 Trail Stand is an effective way to lift the rear wheel of a motorcycle for required service when other means are not available and short term maintenance or repairs are necessary. 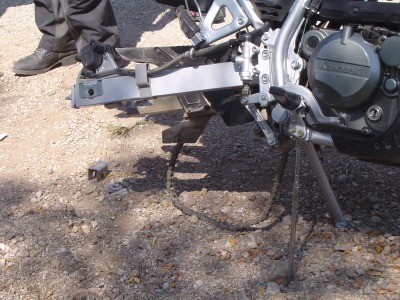 The Trail Stand supplies a third point of support replacing one of the wheels on a motorcycle equipped with only a factory installed sidestand. The Trail Stand should not be used for prolonged maintenance. Caution, the Trail Stand is a device to aide in the service of a motorcycle where a more stable lift is not available. It is the responsibility of the user to use extreme caution when using this lift product as with any other lifting device! For use on dual sport motorcycles up to and including the KTM 950 Super Enduro.  Only use the Trail Stand on a flat, level and firm surface for stability.  NEVER place yourself in any position that would allow yourself or others to be hurt if the motorcycle falls when using the Trail Stand. 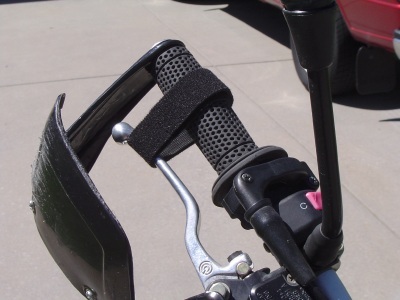  If removing a wheel always loosen any fasteners before lifting the motorcycle with the Trail Stand. Make sure that axle moves freely, if removing, before using the Trail Stand to lift the motorcycle. 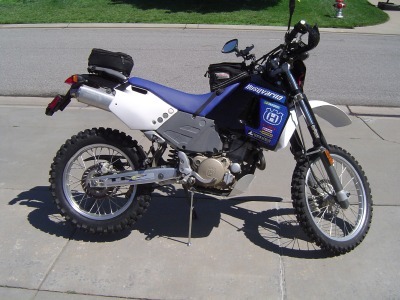  NEVER push heavily or strike the motorcycle for any reason while lifted on the Trail Stand! Also beware of high winds when motorcycle is supported with the Trail Stand!  Since every motorcycle has different frame geometry and balance points it is the users responsibility to evaluate the positioning of the Trail Stand for safe use. If the Trail Stand cannot be used to lift the motorcycle in a safe manner it should not be used.  Always adjust the height of the Trail Stand so that the wheel of the motorcycle to be lifted is at the minimum height off the ground, setting the Trail Stand height higher than necessary will increase the motorcycles instability. More weight on the Trail Stand increases the stability, never tilt the motorcycle to an extreme angle on the kickstand so that it becomes unstable.  Always position the Trail Stand vertically to maximize the stability of the motorcycle, adjust the Trail Stand height so that the foot of the stand is flat on a level surface for maximum stability.  The front wheel should be turned to the left and the brake locked with the provided strap for stability, before the rear wheel is lifted.  A typical point for lifting the rear wheel is to position the Trail Stand under the frame near the right side foot peg, or in another position that allows for stability when lifting the rear wheel. Always locate the Trail Stand so that it will not slip.  On some motorcycles it is possible to lift the front wheel of a motorcycle with the Trail Stand. Always locate it in a position that will not allow it to slip, such as a hole in the front or side of a skid plate. Motorcycle geometrys vary it is the user responsibility to decide if it is safe to lift the front wheel of the motorcycle in this manner. 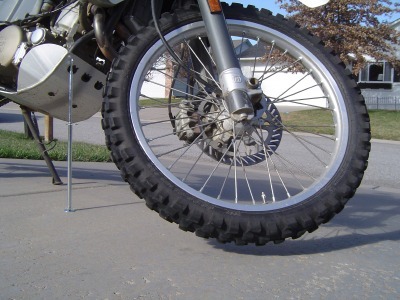  The motorcycle should be in gear (not neutral) when lifting the front wheel of a motorcycle with the Trail Stand. If possible use the strap around the frame to lock the rear brake lever down. When lifting the front wheel a weight such as a large rock can be used next to the right side of the rear wheel to increase stability.  Whenever possible have an assistant steady the motorcycle to prevent movement of the motorcycle that might cause the motorcycle to fall from a lifted position. 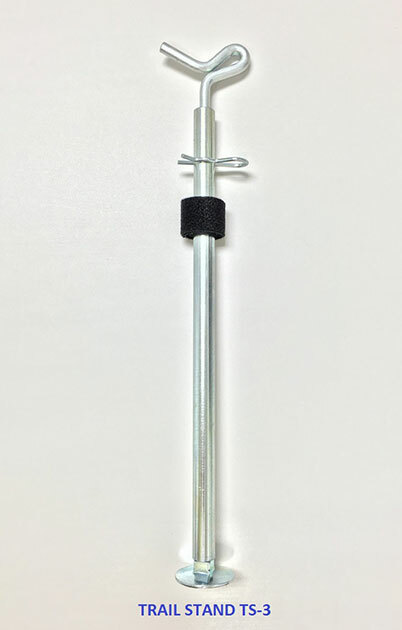  The spring clip is used to set the height of the stand and retains the cradle in storage position. 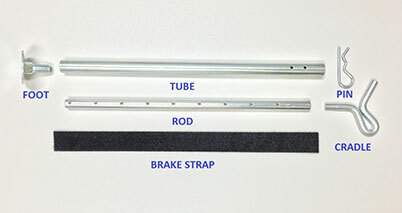 It is not necessary for the cradle to be pined when supporting a motorcycle as the cradle will rotate to the most stable position. See photos for reference.